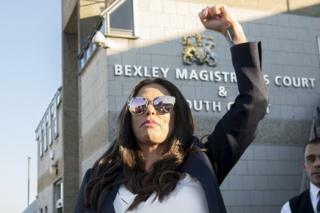 TV star Katie Price has been convicted of being nearly twice the legal limit while in charge of her pink Range Rover. The 40-year-old argued she was not in control of the 4X4 when she was arrested in a drunken state in the back seat in Greenwich in the early hours of 10 October. She said that a mystery man had driven but Judge Nigel Dean found she was not a "credible" witness. She was banned for three months. A charge of drink-driving was dropped due to insufficient evidence. The three-month driving ban adds to another from earlier this year for driving while disqualified, Bexley Magistrates' Court heard. Along with a £1,500 fine, Price was also ordered to pay costs and a victim surcharge to bring her total bill to £2,425. The court heard PCs Benjamin Jones and Balvinder Mann first saw the Range Rover veer off the road and hit a grass verge at 00:40 BST, before seeing it stationary about 15 minutes later. PC Jones told magistrates Price, of Horsham, West Sussex, was in a "very" drunken state in the back while her friend Kris Boyson was in the passenger seat. "Her eyes were blurred and her speech was a bit slurred," he said. The officer said the bumper was hanging off, pieces of shrubbery were attached to the vehicle and there also "appeared to be sick on the outside". She said she allowed one of his friends to drive the car back towards Mr Boyson's house near Bluewater - and did not remember any crash. "I was really drunk. I'm such a lightweight," she said. Both Price and Mr Boyson claimed the unnamed driver had fled following an argument, the court heard. PC Jones said the pair claimed the driver had the key but the car's engine later turned on. Both officers were unable to ascertain who had been driving at the time. Prosecutor Sonya Saul told the court Price was taken for a breathalyser test at a police station. She had 69 microgrammes of alcohol per 100 millilitres of breath. The legal limit is 35 microgrammes. Speaking outside court after the sentencing, Price told reporters: "It got proven today there was no evidence at all of me drink-driving so I rest my case on that." "I get my driving licence back on 24 May which means I can go car shopping - let's ban the pink car."